Teamwork is great. Cooperative boardgames foster a sense of camaraderie and kinship between the players as they work together to solve problems and save the world. But after your goody two-shoes team saves the day for the umpteenth time in a row, you might feel the sinking feeling that you'd rather punch your know-it-all teammates right in the kisser and start a knock-down, drag-out, battle royale to the bitter end. That must mean it's time for another Light Grey Game Night! So mark your calendar for Thursday, April 9 from 6:30 - 9:30 pm! As you might remember, we're attaching a theme to each night to help people narrow down what games they might want to bring (although you're still welcome to bring whatever you'd like!). 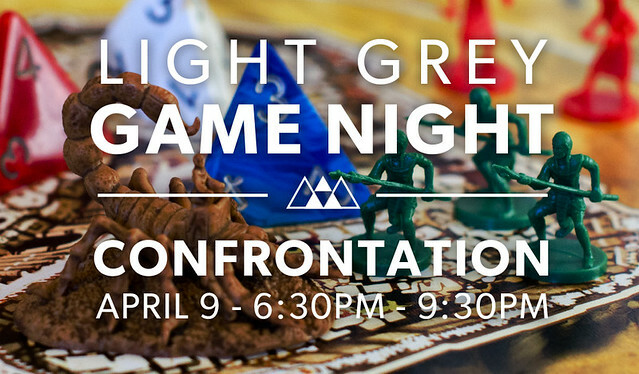 This week's theme is confrontation (although those of you who are confrontation adverse, no worries, we'll have plenty of friendly games to play as well)! In the immortal words of the great Alice Cooper, no more Mr. Niceguy. We're going to fight dirty in a head-to-head struggle for dominance with games like the lightning-quick area control game Kemet, the otherwordly Nexus Ops, the cheating-filled Kaosball, or the sophisticated but coldly calculated game of Coup, among plenty of others! If you have a favorite boardgame, bring it! hey very informative post, i like the way you framed everything, thanks for posting.